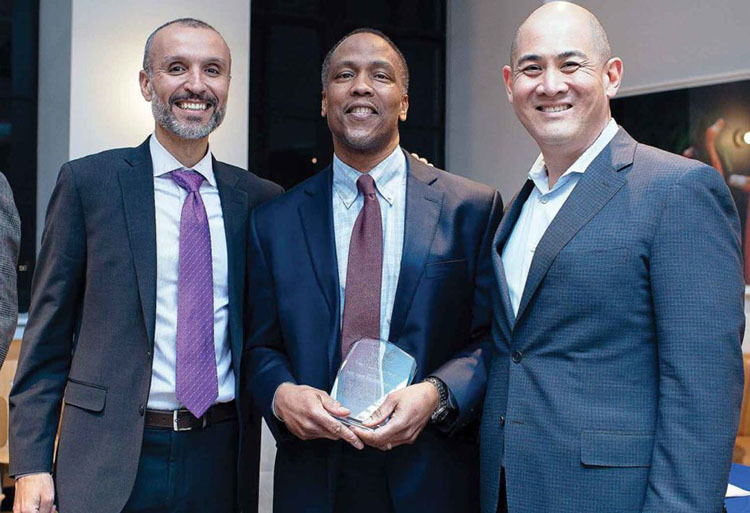 Anthony Samuels is one of the first 10 Participating Enterprises to complete the Eastern Bank’s Business Equity Initiative program and was recognized with the other first participants on March 8, 2019, at the recent event. Mr. Samuels is the Founder and CEO of DRB Facility Services, a Boston-based provider of corporate janitorial, landscaping and snow removal services in the Northeast. In the above photo here, Mr. Samuels (center) is pictured with Juan Lopera, Corporate Business Diversity Officer, Tufts Health Plan and Keith Wang, Vice President, Procurement and Strategic Sourcing, Tufts Health Plan. BEI is a program of the Foundation for Business Equity that launched in 2017 and has formed a community of partners that combines the expertise, collective networks and philanthropic goals of the Greater Boston Chamber of Commerce Pacesetters Initiative and the Boston Foundation’s Business Equity Fund to help enterprises of color to grow. Tufts Health Plan is a member of the Greater Boston Chamber of Commerce Pacesetters Initiative. Since Samuels’ participation in BEI began, they are working together as part of the Pacesetters purposeful matchmaking process designed to increase contracts and dollars spent with enterprises of color. Anthony Samuels, CEO of DRB Facility Services said, “BEI has allowed me to identify the areas where I need to make changes in order to grow. Thanks to the advice and recommendations I’ve received, we are on target to grow revenue by more than 50 percent in 2019.” DRB is also projecting to add more than 180 new employees to its existing 450 employees, most of whom are people of color.